Am I a poet now? Courtesy of V.H. Hammer on Flickr. Found through Creative Commons. I just handed in a short poetry collection that I worked on for a semester. 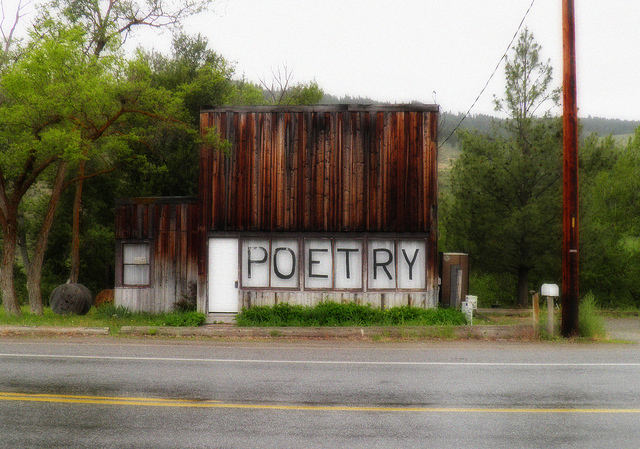 That’s right: poetry. This class was certainly a transformative experience. I’ve learned to appreciate the emotional stake, the inspired language, and the truth in works of several poets (Sylvia Plath, James Tate, James Wright, to name a few). I’ve also learned a great deal by reading my classmates’ poems and seeing their style. In my poems I talked about myself and my family, and it was weird, because I’ve become so used to writing fictional lives. Some elements in these poems surprised me; they came out of nowhere. Writing poetry helped me explore why I’m the person I am today. Here’s a poem that I’m proud of, just because I’ve never written something like this before. I was inspired by my days in New York. I look forward to revising it even more. and it’s time to go home, finally. It’s the smell of piss that gets to me. Subway ads are far more interesting. would never have to do this. And she will not understand. down, down, down we go. to be reminded of home. so we run for cover. We wait for the lull. and it’s time to go home finally. A man sits across from me.